I like to give my animals the biggest possible enclosure, and at the same time, try to provide an appropriate environment for any given species. Space is often a limitation for owners and I like to use the ‘upward’ space for a lot of my animals. 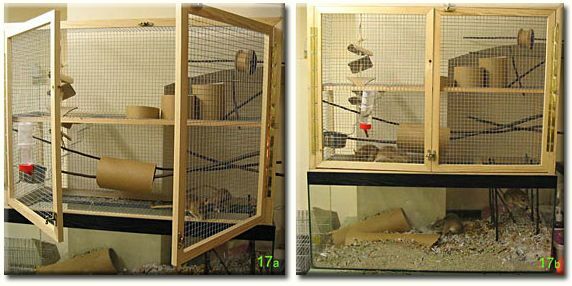 In particular, Persian jirds appreciate taller cages, naturally being rock hoppers. I have therefore designed an enclosure that will provide an area for food storage and hoarding requirements using a glass fish tank, whilst providing a cage extension on top to satisfy their jumping and climbing skills. The following instructions show you how we have made our newest cage extension. Start off by making a plan. It doesn’t have to be a masterpiece, but make sure you have a clear idea of what you plan to do. Be sure to measure carefully and think ahead of how to structure things. Start by planning the base to fit into the tank. 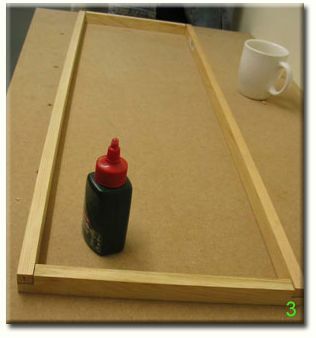 Most have a small shelf on which a simple wooden frame can sit (2a). There are plenty of ways to join the wood, but we find it better to do it as illustrated (2b). Measure out instep at the end of the wood and using a saw cut half-way through the baton. 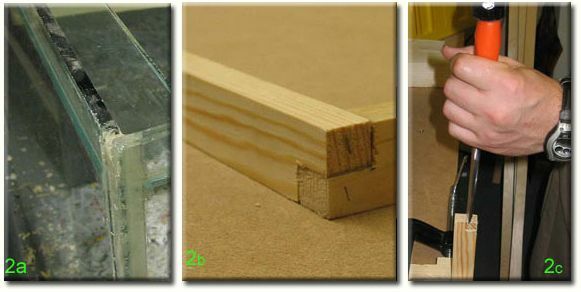 Secure wood safely and use a chisel and a hammer to carefully to remove wood to create the joints. (2c) A small amount of glue is used in the middle of the joint, making sure it does not ooze out the sides, followed by additional nails to secure. Now the base is made, the next step it to decide how tall you want to make your cage, whether it be one storey, 2 storeys, whatever. For this part, we used a slightly thinner wood, simply because you can use cheaper pieces for this section as a lot of the rigidity will come from the wire when attached later. The h-shape structure (4a; arrow) makes up one of the side panels. There are lots of ways to join the wood, cutting out insteps as above, drilling small holes and gluing in dowling rods or using metal brackets. We find cutting out the insteps works best as it is simpler and quicker to do. Clamps were used to hold wood in place while the glue was drying to ensure accurate joins (4b). Image (5a) illustrates 2 h-shaped side frames joined to the base frame to create the side panels. (5b)Two more horizontal batons are added to create the first floor (yellow arrows), by simply gluing them into place. A simple joint made using wood cut at a 45 º angle (red arrow) is used to simply secure the top of the frame, again using wood glue. To give the structure extra security, metal L-shaped brackets are attached to the joins. (6) That is the main frame of the cage completed. Next to be made are the doors. For this cage, we decided to make two large, front opening doors. (7) These were made by using a frame of thinner wood, making sure they fit snugly within the front panel of the main frame. The joints are again made using wood cut at a 45 º angle and glued. That is all the wood work finished; now it’s onto the wire. Start by adding wire to the doors as this seems to be an easy way to begin. (8a) Previously, we have used U-shaped pins, but since investing in a heavy duty staple gun, building cages has become much quicker and easier (and there’s also been less swearing). Securely attach mesh using enough staples or pins to hold it into place (8b). Make sure the wire is pulled taught when attaching it. Adding the wire will give stability to the door frames. Once all the wire is attached, decide on the size and location of holes in the various floors, (13) bearing in mind the way they will be used by the animal and the affect they make have on the structure of the frame. 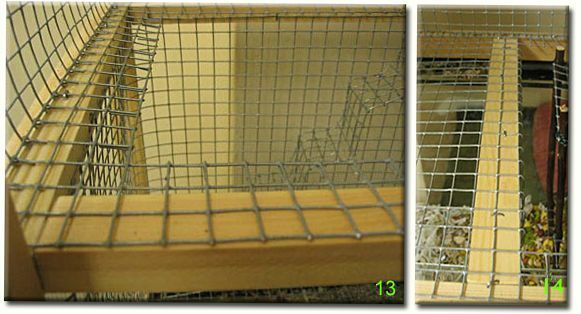 It is easier to cover the floors of the cage in one piece of wire and then cut out the hole once in position. This makes it easier to place the hole exactly where you want. Bend back any loose exposed ends of wire to prevent injury. To make the holes more rigid, we glued in strips of wood to create a strong ledge. (14) Leave extra wire when cutting and wrap this under the wood to prevent chewing of the ledge. Now that the main cage is finished, all that needs adding is the doors. We chose to use large hinges, (15) as that is what we had, but you could use any type of hinge. For ease of fixture, these were screwed to the outside of the cage, but could easily be attached inside for a neater look. The final detail is to add a secure catch to prevent escapees. (16a & b) There are a number on the market to choose from. Remember, you need them top and bottom on the doors, otherwise they will just open if only attached in the centre. The finished cage extension should fit snugly on the top of the tank. 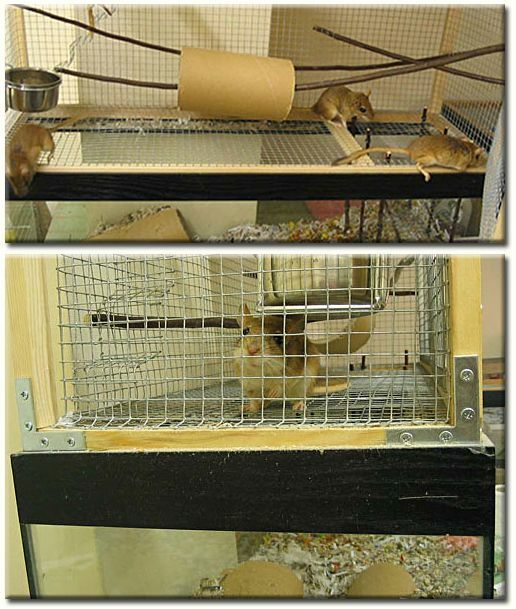 The wire floor can be covered in paper or wood to make it more comfortable for the animals. 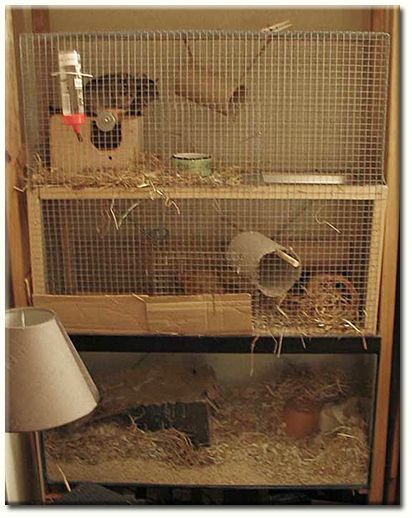 A few furnishings and the cage is ready for its new occupants. 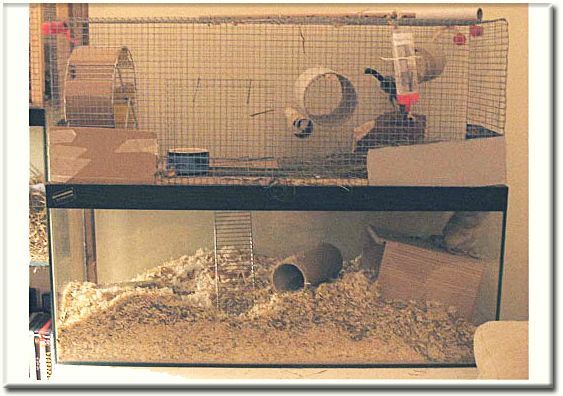 This cage is currently housing 3 persian jirds who seem to love it, but I’m sure many animals would enjoy this type of cage. Below, the Persian jirds can be seen investigating their new tank extension! Below are two other examples of tank toppers.